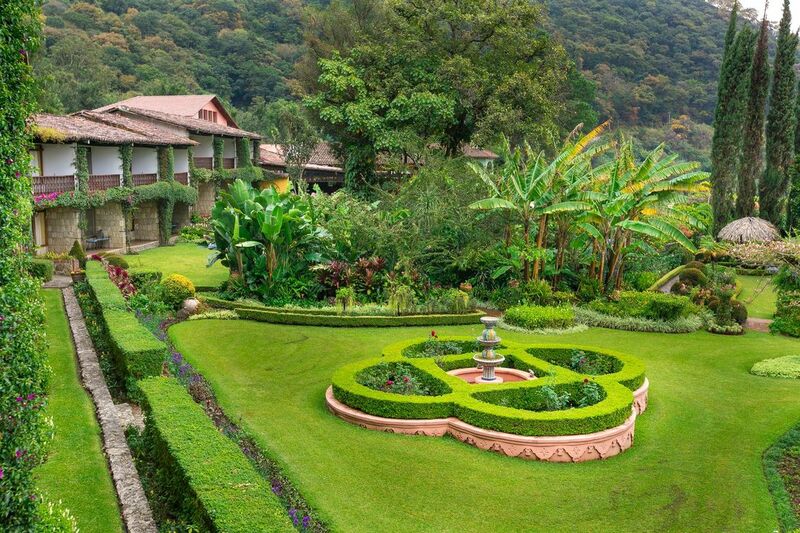 Over thirty years ago, as Hotel Atitlán was being built, the gardens you see today were already being designed. It is easy to sense the devotion that went into creating these magnificent grounds, as owner Susan Rivera’s love of flowers and attention to the beauty of the gardens is ever present. The Gardens are a spectacular collection of individual areas, each with its own identity, and they extend from the hotel entrance to the edge of the lake. As the water level of Lake Atitlán has receded, the garden has expanded in a series of terraces and is broadly divided into luscious tropical gardens, formal rose gardens and the owner’s personal selection of colours and textures. Teeming with flowers of every description and colour, the gardens are a wonder in this part of the world. Over two hundred varieties of roses make up the Antique, the Modern and the David Austin Rose Gardens. There are also more than 50 varieties of hibiscus, vines, English style knot gardens and a tropical heliconia garden. 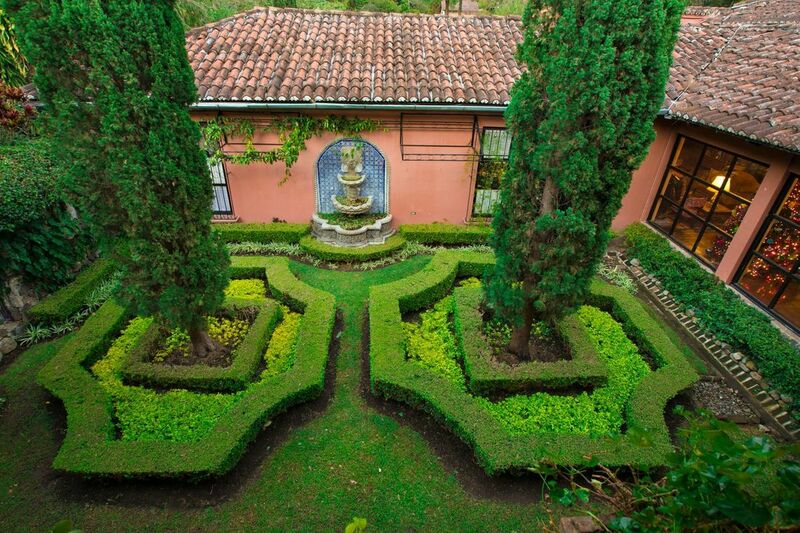 Other botanical experiences include a Wedding Garden, a Coffee Garden and a variety of orchids. More than 25 colours of bougainvillea and an Azalea Garden provide a dazzling display of palettes. ​Teeming with flowers of every description and colour, the gardens are a wonder on this part of the world. Over two hundred varieties of roses make up the Antique, the Modern and the David Austin Rose Gardens. There are more than 50 varieties of hibiscus, arbors of vines, English style knot gardens and a tropical heliconia garden. Other botanical varieties to delight your senses include a wedding garden, a coffee garden and a variety of orchids. More than 25 colours of bougainvillea and an azalea garden provide a dazzling display of palettes. 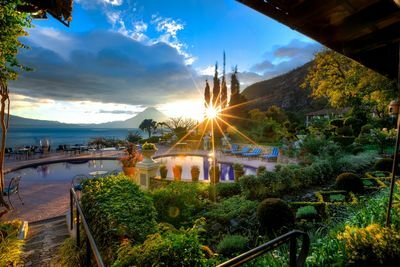 Strolling the gardens with breathtaking sights of the pristine lake and volcanoes provides the ultimate ambiance for relaxation and retreat for your body and soul. A paradise for birdwatchers, this old coffee plantation contains abundant trees and plants that are habitats for a variety of birds. Suspension bridges spanning the gullies and streams offer splendid views. The taller trees are covered with moss and epiphytes (air plants), giving the impression of a cloud forest. If you look carefully, you can spot the monkeys hidden in the trees. Nested within the rainforest on our property are special locations chosen for the serious bird watcher. The list of birds sighted on our property has now exceeded 250 species. At night, some of these locations also offer guests opportunities for magnificent glimpses of the universe beyond. 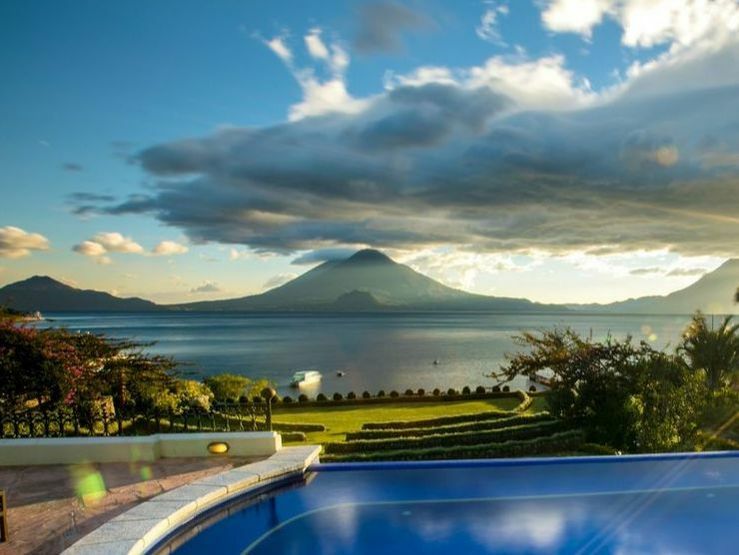 Almost every angle of Lake Atitlán and its surroundings showcase nature in an incomparable ecosystem with prodigious bird diversity. Directly across from the Nature Walk, the Butterfly Reserve features trails, a laboratory for chrysalis and pupas, more than 2,000 plants and over 500 butterflies of the 25 species native to Guatemala. Book a sailing cruise or fishing charter on one of the many boats berthed on the Hotel. Contact Reception for more information and assistance with arrangements.